We are hearing new promises that synthetic biology and GMOs 2.0 will combat climate change, decrease pressure on land or even save endangered species. But these promises are just industry hype to encourage investment and keep away regulators. Would you put these items on your shopping list? Gene-silenced apples that don't rot; synthetic vanilla made with genetically engineered yeast; canola, DNA edited to resist pesticides. These are just a few of the new genetically engineered products already making their way to a store near you. We call them GMOs 2.0 -- and they may even be misleadingly labeled as "natural." How will you know if you're eating synthetic GMO 2.0 foods or putting them on your body? For those who want to "keep it real," we have developed a handy Shopper's Guide to Synthetic Biology. Here are the key things to know. Genetically Modified Organisms (GMOs) have been in our food for 20 years, but the underlying technology has recently been changing. Corporations are now tinkering with nature in new and riskier ways. They can change a species by editing or deleting genes, turning genes on or off, or even creating whole new DNA sequences on a computer. Some food and cosmetic companies are now experimenting with synthetic biology. 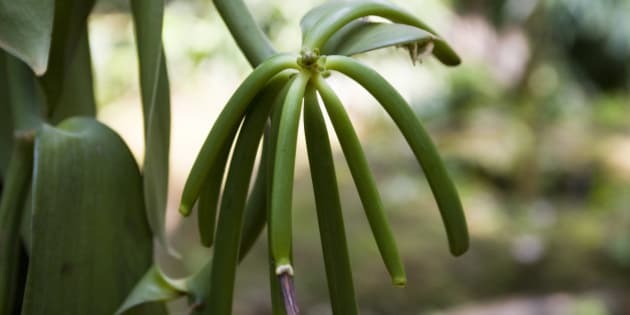 This new field of genetic engineering produces artificial compounds that taste or smell like familiar substances, but don't actually come from the natural source. Synthetic biology versions of food ingredients including vanilla flavour, saffron and stevia. Synthetic biology personal care ingredients, including rose oil, patchouli fragrance and squalane moisturizer. So were GMOs 1.0, for that matter. "When you alter the genetics of living things they don't always behave as you expect," says Michael Hansen, PhD, senior scientist at Consumers Union. Some first-generation GMOs had unexpected effects such as unwanted toxic compounds. The next generation may be even more unpredictable. Synthetic biology companies try to present biology as something that can be reliably and predictably altered, but this field is still highly experimental and genetics are poorly understood. Many governments require little to no testing to ensure the safety of GMOs, and systems are not in place for adequate oversight to understand the health, environmental and social impacts. Some companies tout GMOs 2.0 as environmentally efficient. But many current synthetic biology products depend on sugar from chemical-intensive monocultures, or other polluting feedstocks such as fracked gas. If GMO 2.0 products such as engineered algae escape into the environment they may become "living pollution." GMO crops linked to patented seeds or chemicals are already displacing farmers around the world. With the new generation of GMOs, traditional plant-based ingredients farmed in sustainable ways by real farmers may be replaced by synthetic biology products produced in labs. My organization, ETC Group, has interviewed farmers around the world who are concerned about the impact of synthetic biology products. The fact is, small farmers feed most of the world. If their livelihoods are undercut by artificial synthetic biology, their families and communities will suffer -- along with the fields, forests and web of life that they protect. A key problem with genetic engineering has been that it puts corporations in charge of our food system with patents that allow them to own the seeds of life. Corporations have incentives to also use the new genetic engineering to maximize profits, not protect people and the planet. For decades, we have been falsely promised that GMOs would solve hunger and protect the environment -- yet people still go hungry and instead farmland is saturated with toxic pesticides. Today we are hearing new promises that synthetic biology and GMOs 2.0 will combat climate change, decrease pressure on land or even save endangered species. But these promises are just industry hype to encourage investment and keep away regulators. Companies touting these technologies have not shared any data to back up sustainability claims, and there are many sustainability concerns when you look at the lifecycle of the products, including the environmental problems of feedstock crops that are grown on land that could be used to feed people. Instead of falling for false claims about fake foods, we need to build a food system that is truly keeping it real: one that supports small farmers, local communities, consumers and the environment. A look at trends in the marketplace shows that consumers want real, natural foods and cosmetics -- not synthetic biology or GMOs. They want authentic ingredients from real farmers, not corporate labs. They want to know what's in their food with clear understandable labels not double-speak about "fermentation derived" or "cultured ingredients." If it's a GMO -- call it a GMO. As Fortune magazine reported last year, "Major packaged-food companies lost $4 billion in market share alone last year, as shoppers swerved to fresh and organic alternatives." "It's pretty simple what people want now: simplicity ... less of the ingredients they can't actually picture in their head." 1. Buy organic: Organic is best because it ensures that food and ingredients are grown in ways that are better for people and the planet. Organic farmers are not allowed to use genetically engineered crops or synthetic pesticides. 2. Look for Non-GMO Project Verified or Made Safe a's trustworthy certifications that ensure products are not genetically engineered or made with synthetic biology. 3. 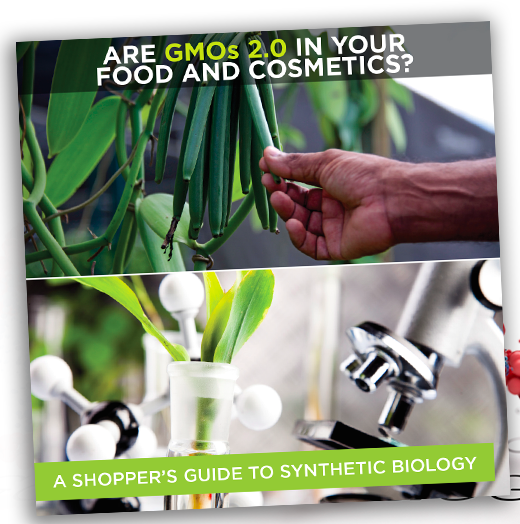 Download the new Shoppers Guide to Synthetic Biology and keep up to date with the latest synthetic biology products and ingredients here.